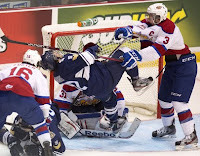 Mark Pysyk picked up an assist Friday as the WHL Champion Edmonton Oil Kings opened the 2012 Memorial Cup with a 4-3 win over the host Shawinigan Cataractes. The teams combined for a five-goal third period capped by a Henrik Samuelsson ('12) game winner at 13:42. Griffin Reinhart ('12) notched a goal and an assist to earn the game's #1 star. The teams traded goals in the opening twenty with the Cataractes' tally coming on the power play thanks to Pysyk's roughing penalty at 7:56. The bigger, stronger Pysyk defended his crease after the whistle (right), sending a Cat forward to the ice in the process and him to the box for 40-seconds before the Cats tied the game. The tie would hold into the third period, but the gates quickly opened with Reinhart's goal at the 1:01 mark. With the teams playing four-on-four, Pysyk drew two defenders his way before sliding a pass to Martin Gernat (EDM) for a wrister that upped the Oil Kings lead to 3-1 at 5:32. The Cataractes kept the heat on with two goals to make it a 3-3 game before Samuelsson finished a nice three-way passing play to get his third game winner of the playoffs. Pysyk, who rounded his effort with two hits, would again head to the box with just under five minutes to play, but this time his mates were able to kill the it off and preserve the lead the rest of the way. The Oil Kings will now get the weekend off before facing the defending champion Saint John Sea Dogs on Monday.